The scene on Caton Road with numerous police vehicles and the police dog unit. 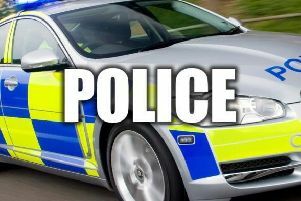 A car that had been reported stolen from a house in Lancaster was stopped by police on Caton Road. The incident unfolded outside the Holiday Inn at 11am on Thursday with a large number of police vehicles and a police dog unit surrounding a black Chrysler. The vehicle had initially been traced by police at junction 8 of the M61 where it travelled northbound and came off at junction 34 Lancaster before it was stopped on Caton Road. The owner of the vehicle reported that a friend had taken the black Chrysler for an MOT and never came back. The driver of the vehicle was stopped by police on Caton Road and detained. There was some confusion around the man taking the vehicle and the car was returned to its owner.